Foreclosure activity in Colorado metropolitan counties continues to be near multi-year lows. Over the past two years, foreclosure rates have been exceptionally low compared to the previous decade. March 2018 foreclosure filings were down 20 percent from March 2017, dropping from 540 to 432, year over year. March 2018 foreclosure sales (completed foreclosures) were down compared to March 2017 with a decrease of 33.9 percent, dropping from 177 to 117, year over year. Filings rose 6.1 percent from February 2018 to March 2018, and auction sales were up 19.4 percent over the same period. For the first three months of 2018 as a whole, foreclosure filings were down 11.8 percent, compared to the same period of last year. Filings fell from 1,429 for the first three months of 2017 to 1,260 during the same period of 2018. 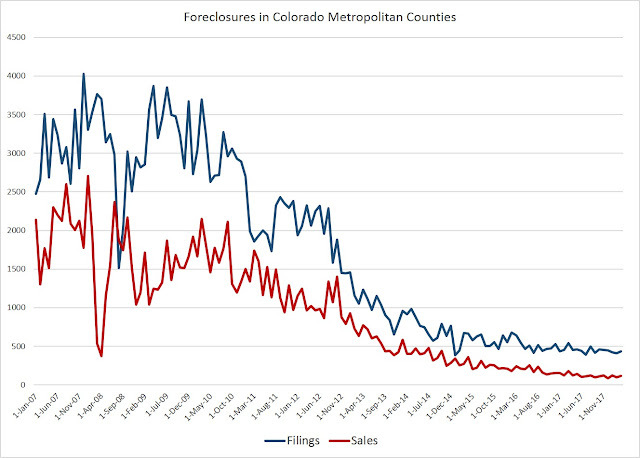 Foreclosure sales were also down during the same period: sales fell 24.9 percent from 450 to 338. Pueblo County reported the highest foreclosure rate during March, while Boulder County reported the lowest rate. There's not a whole lot to say here except that foreclosure rates are low, and currently show no signs of heading back upward. So long as home prices continue to climb quickly upward, even those homeowners who have troubles with income can always just sell their homes in order to avoid foreclosure.